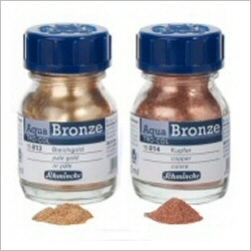 Schmincke Aqua Bronzes are genuine metallic watercolour paints made using real metal. They are very lightfast, more opaque and more brilliant than other metallic effect colours. They come as a powder which contains a watercolour binder. You simply need to put some powder on the palette and mix it with a little water until you have your preferred working consistency. You can also add a little of the powder to regular watercolours to achieve different effects. There are five colours in the range which are rich gold, rich pale gold, pale gold, copper and silver.